I write this in despair and hope. The reasons for despair are many but the only cause for hope is the expectation that Aiyappa will not let his devotees down. 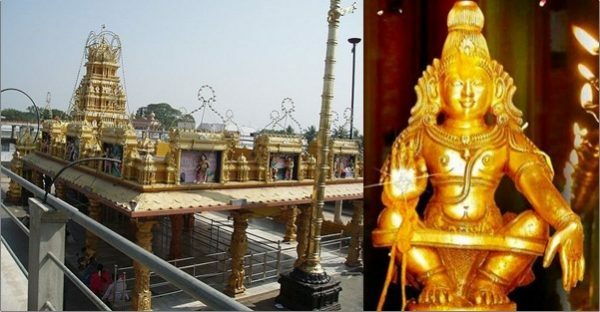 The Sabarimala petition demanding the entry of women in the garbhagriha of the Temple was heard today. The hearing will continue tomorrow as well and my dear friend, Sai Deepak will fight the good fight for Dharma. May Ma Saraswati shower her blessings on him as she always has lavishly. Today’s hearing began with a phantom claim by R.P. Gupta, the lawyer representing the petitioner, that the temple has Buddhist origins. Basically, he meant that it’s not even a Hindu temple and therefore, Hindus have no claim over it. He went on to make the case that the Sabarimala temple is a part of the Indian State as per the constitution. The lawyer further questioned the 40-day celibacy oath that devotees take before visiting the temple, contending that this ritual was not an “essential” part of the tradition of the temple. He spoke with supreme confidence that we associate with deluded Marxist professors that the bar on entry of women inside the temple was originally based on the difficulties faced by women in visiting the temple in the olden days. He requested the court to strike down a tradition that was “based on superstition”. This begs the question – what is superstition and who decides if a religious belief is superstitious or legitimate? For an atheist, all religion is superstition. But on to the entry of the next stalwart, Ms. Indra Jaising, who equated the practice with untouchability. In other words, not allowing women in one out of tens of thousands of temples in Kerala amounts to apartheid. Meanwhile, the counsel for the government of Kerala informed the court that the state government has reverted to its original position in support of entry of women of all ages. As fate would have it, the state government is headed by the Communist Party of India (Marxist). It is interesting how they are attacking the tradition from all sides. They know that Sabarimala is special in more ways than one. They know that Aiyappa Swami is a great unifier of the Shaiva and Vaishnav traditions. They know that there are many temples like the Chakkulathukavu bhagavathy temple, where only women are allowed during certain pujas. They know about the Panchabarahi temple, where men can never enter. They know about Attukkal pongala, where the Devi can be worshipped only by females. They surely know about Vaishno Devi, where pre-pubescent girls are worshipped every day, boys never. Yet they are hellbent on destroying a special tradition of immense esoteric significance. Because equality. Because modernity. Because hatred. In a decolonized society, it would’ve been a matter of concern had the highest court of the land not dismissed the petition the moment it was introduced. But we live in a mentally colonized India where firang wannabes seek to outdo the west in stupidity probably because they cannot compete with them anywhere else. At any rate, the case is a living example of how anti-dharma forces are colluding to destroy what is left of our ‘pagan’ culture. I lived in Tamil Nadu for seven years but somehow never made it to Sabarimala in neighbouring Kerala despite my senior friend Radhakrishnan K P inviting me so many times. But when I left TN, I thought I would come back to the south one day just to visit Aiyappa Swami. If the petitioners have their way, the tradition would be destroyed as far as I and millions of other devotees are concerned. Sabarimala will never be the same. So, I write this in despair and hope. The reasons for despair are many but the only cause for hope is the expectation that Aiyappa will not let his devotees down. Featured image courtesy: Pinterest and Dainik Bhaskar. Ashish Dhar, an exiled Kashmiri Hindu, is a Mechanical Engineer by training and Co-Founder of Pragyata, an enterprise dedicated to revival of Indic knowledge systems. Writer – IT Techie – Banker Writes Why She Will Support PM Modi in 2019 Hindu Temples: Let the Bells Toll Again Give Priority to Resettlement of Kashmiri Pandits in J&K: VHP Chief Praveen Togadia Release of Film Padmavati Welcome in Bengal Says Mamata Banerjee Kashmiri Pandits Are Refugees in Own Motherland; Raise Voice for Them, not for Rohingya Muslims Injustice for Hindus in India; Does Indian Constitution Justify Articles 28-30?